One of the most fascinating aspects of the ITER project is the technology that is being deployed in order to test the viability of fusion energy at such a scale. For an outsider, the project is a leap to the future. For scientists and technical experts who have spent most of their life in the fusion community, ITER is validating and upgrading existing know-how that has been accumulated throughout the years in fusion laboratories around the world. There will be some, however, who will be given a once in a lifetime opportunity to push the envelope further and use ITER as a laboratory. They will witness technological breakthroughs and pave the way for DEMO, the fusion demonstration reactor planned to come after ITER. Amongst the fortunate vanguard fusion specialists are those involved in the Test Blanket Modules (TBMs). During the last International Symposium on Fusion Nuclear Technology there was a lot of buzz about the progress made in the area of TBMs. What is this blanket made of that is exposed to plasma reaching 150 million°C and what purpose does it serve? We met with Yves Poitevin, F4E’s Project Team Leader for TBMs and Materials Development, to understand the background, the state of play and the potential of this domain. Work started in the late 90s when the European Fusion Development Agreement (EFDA) conducted research to address the need for the development of new materials and technologies for tritium production. The transition from research to licensing and fabrication is challenging. F4E has been collaborating with specialised engineering companies like IDOM, Atmostat, Iberdrola, AMEC, Empresarios Agrupados to take stock of their expertise. Similarly, for the design and qualification phases the input received by laboratories like KIT, CEA, ENEA, CIEMAT, UJV, KFKI, NRG, etc. has proved extremely valuable. Approximately 30 contracts have already been signed in this domain and the work is gradually increasing in volume. 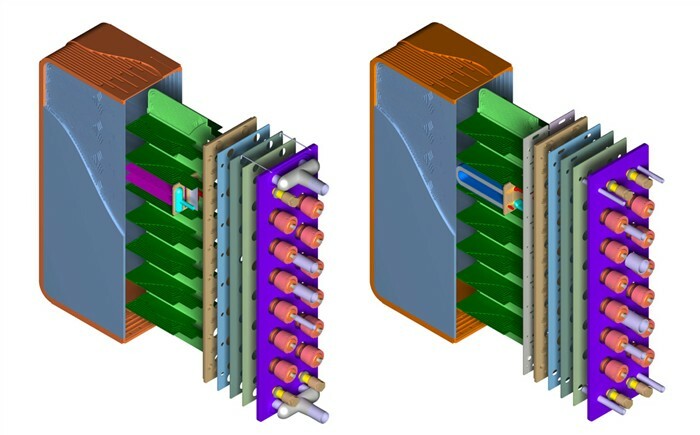 Europe is standing at the crossroads of two blanket concepts: the Helium-Cooled Pebble-Bed (HCPB) and the Helium-Cooled Lead Lithium (HCLL). The key difference lies in the type of material used for the tritium breeder. In order to choose which way to go for DEMO, it has been decided to test both concepts simultaneously in ITER by placing the TBMs in an equatorial port of the machine. In terms of the TBMs structural materials, Europe has set its hopes on EUROFER, a newly developed reduced activation ferritic/martensitic (RAFM) steel developed in Europe, which provides adequate resistance to neutron irradiation, corrosion and with acceptable resistance at high temperatures. “EUROFER is Europe’s choice for ITER’s TBMs because of its properties, its mechanical resistance and its tolerance to neutrons irradiation” explains Yves Poitevin. Part of EUROFER design limits have been recently added to the RCC-MRx nuclear construction code and progress is being made to complete them. Japan, Korea, India and China are also developing their own TBMs for ITER. The potential is there for developing in parallel different degrees of expertise. What is here, however, is the opportunity to invest in and test today a technology that will be necessary tomorrow.